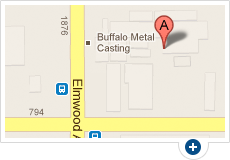 At Buffalo Metal Casting, we've been committed to providing our customers with the highest quality copper castings since 1975. We are the leading single-source supplier of metal castings and parts operating in Buffalo but serving clients nationwide. We are metal casting experts and can guarantee a top-quality copper casting product when you choose to work with us. Our facilities are equipped with a wide range of furnaces, giving us the ability to cast nearly every commercially available metal, including any type of available copper. We are also able to pour high conductivity copper to meet your project's needs. We proudly offer a wide variety of sand casting methods to ensure we meet our client's standards of affordable and efficient production. Below are the methods available for your copper casting. Permanent Mold Copper Casting: Metal is poured into a reusable metal mold to cast your part. Green Sand: Metal is poured into a mold made of a mixture of flour, sand, clay, and water to cast small to medium sized parts. No-Bake Sand Copper Casting: Metal is poured into an expendable mold made of resin, sand, and hardening catalysts to cast medium to large sized parts. Precision Shell Sand: Metal is poured into molds created by blowing expendable sand onto preheated iron mold shapes to cast small to medium parts requiring higher precision. Harrison Flaskless Matchplate Mold Machine: An automatic mold creating machine employing green sand to create parts. If you're looking for the most reliable, efficient, and affordable company to cast your copper parts, contact Buffalo Metal Casting today. You can call us now to get started right away, or click below to easily request a quote! Request A Copper Casting Quote!